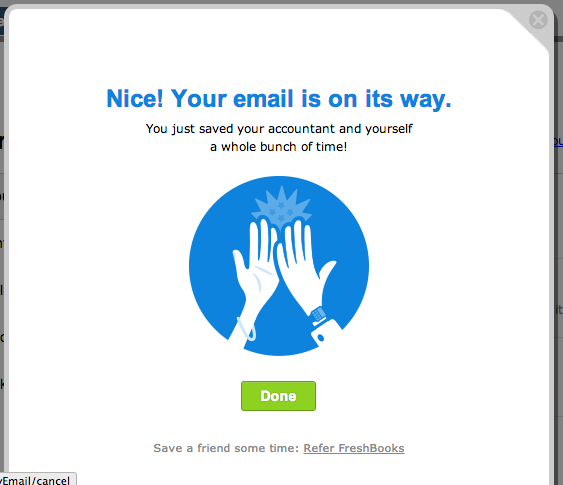 Thursday, while most of us were freaking out about Valentine's Day...FreshBooks was releasing a handy new feature. With tax time fast approaching, one of the big problems business owners face is getting their data sent to their accountants. If your accountant isn't up to date with cloud-based services like FreshBooks...it's even more difficult. Time was, you'd just burn a copy of your QuickBooks file or a few Excel spreadsheets onto a CD, or copy them to a flash drive and drop it off at their office. Or, if you are particularly blessed, you would print out hundreds of pages that make up the General Ledger. If you were using FreshBooks in previous years, it wasn't always clear how to give the accountant all the data they needed. As a bookkeeper, I could usually generate a few key reports that would give me the info I needed. As a business owner who signed up for FreshBooks because of its simplicity, the process wasn't always clear. 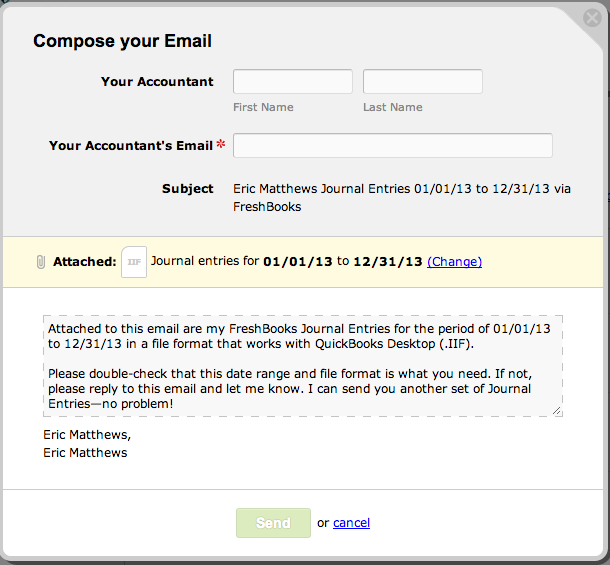 This year FreshBooks has added a feature that allows you to quick create and send journal entries to your accountant. The good news is...it's simple to use and you don't need to know what journal entries are before you send them. If you log into FreshBooks, and click on Reports...you'll see a new link. Click on the link and you're given a pop-up dialogue. There are two key bits of info here. 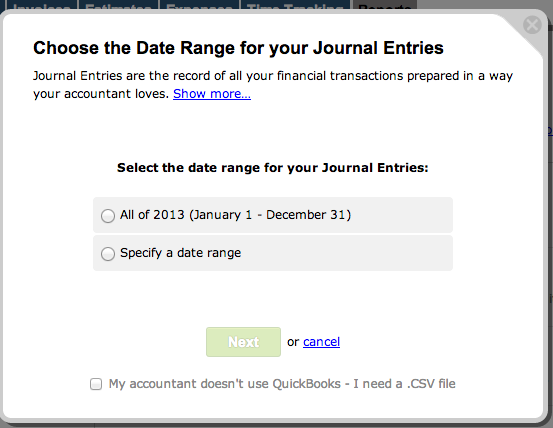 By default, it selects the previous calendar year as the dates for your journal entries. You can select the default or choose your own date range. Below the Next button is a very important checkbox that says "My accountant doesn't use QuickBooks - I need a .CSV file". By default FreshBooks will create a QuickBooks-friendly file that your accountant can use to import your data directly into QuickBooks. If they aren't using QuickBooks, or if you want a little more control over the data, make sure to check this box. This will instead give you a .CSV (comma-separated values) file. Your accountant will usually open this up in Excel in order to pull out the information they need. Click Next and you're brought to a simple email screen. Fill out your accountant's information, edit the message if you'd like, and press Send. It's seriously that simple. In about 2 minutes you've sent your accountant all the information you've collected in FreshBooks throughout the year, and in a format they can work with. Once you've hit send you'll get this final message. When I tried it out with my own data, I got an email immediately. It contained a .zip file with the .csv inside. I opened it up, and guess what? All my data from 2013 in a math-nerd's favourite format...a spreadsheet! If you're a business owner running FreshBooks, ask your bookkeeper/accountant if they'd like these journal entries mailed to them this year. And, if you're a bookkeeper, make sure to let your FreshBooks-using clients know that this feature is now available. Check out the post on the Freshbooks blog for more details. I just wanted to let you all know that a post I wrote for Freshbooks just went live today. It's part of their Tax Thursdays! series, and deals with how to get your taxes done...even if you've left it until the last minute. If you fall into this category, you may find some helpful tips.